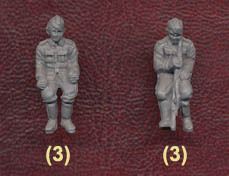 Although not a figure set we have included this model here for completeness as it appears in the enormous HaT figure range. The German Army of 1939 to 1945 was still heavily reliant on horses and horse-drawn transport, and the vehicle we find in this set, the Hf.2 Heavy Field Wagon, was one of the basic forms of wagon which was used for a wide range of purposes. This is an excellent little model, produced in a nice hard plastic, with crisp, well-made pieces to ensure this is very easy to put together. Indeed some of the pieces do not even need gluing, but everything has been well engineered. The detail is good with perhaps only the brake lever being noticeable by its absence, and everything is entirely accurate. The canopy is separate, and could be left off, although you would then need to supply the hoops on which it rested. The two horses are also very good, as are the harness items. This wagon weighed 0.8 tons empty, and could be up to 2 tons when full, so it was usually pulled by four horses or even more. However photographs show that if the roads were good then it was sometimes pulled by just a pair, as we have here, although ideally four might have been provided. The two crew figures are a bit of a squeeze, but reasonably done, and as always add life to the wagon itself. This is a lovely model and a vital part of the logistics of the German Army during the Second World War. Preiser - masters of this sort of model - have already made this vehicle, which we reviewed here. That is a great model too, but while the HaT model offers less options and a smaller team, it has the significant advantage of being in the most useful scale, plus you get three in each box. This is a very good product and essential for so many models and games involving the Wehrmacht on the move. Note. Since this review was originally published we have received reports that HaT have reissued this set with the wagon in a very soft plastic that is difficult to manage and suffers very badly from flash. If as seems possible the first batch was made in a hard plastic and later ones done in a soft, inappropriate material, it is well worth checking which type you are purchasing before parting with your money. You have been warned!